Today, on Thanksgiving Day, Nov. 22, 2018, as on every other day there is so much to be thankful for. For waking up, for food, clean water and shelter, for friends and family, for the opportunities to volunteer and the ability to do so. this year at age 57 I returned to school, taking Horticulture classes at a local junior college to update my skills and knowledge. I overdid it with four classes, so my time management skills have been as severely tested as my ability to memorize and learn new concepts. Without my daughter’s help it would be less successful. Finch Frolic Garden continues on and as we close the garden to the public for the winter, it remains open and thriving for wildlife seeking clean water, shelter and food as well. 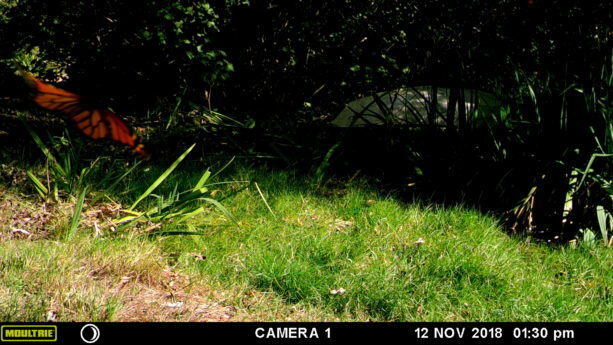 For my birthday, Miranda bought me a game camera which has recorded some interesting life in the bog area of the pond. Now we know why the irises are always smashed. The two glowing orbs from under the boat are just reflections, not a monster, but the ones from the pond are invasive bullfrogs. The juvenile red shouldered hawk has been walking around in the bog several times. Pond life is full of surprises! We didn’t burn this go round with wildfires. We are maintaining, and therefore are so grateful for everything that we have, even the troubles that we have as they are not as severe as so many other’s. 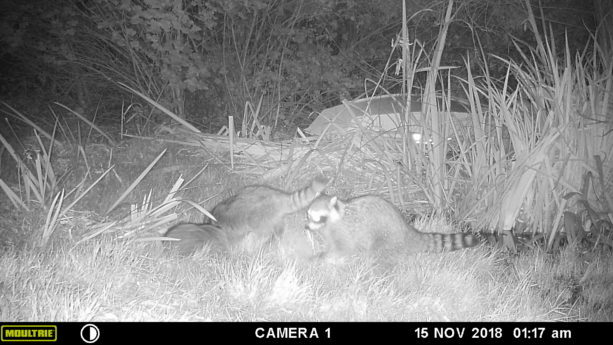 I am especially grateful to have a permaculture habitat so that these animals can survive. Have a wonderful Thanksgiving everyday. Thanksgiving morning, September 22, 2018, at Finch Frolic Garden Permaculture pond. Pardon the squeaky camera lens and the leaf blower from somewhere. 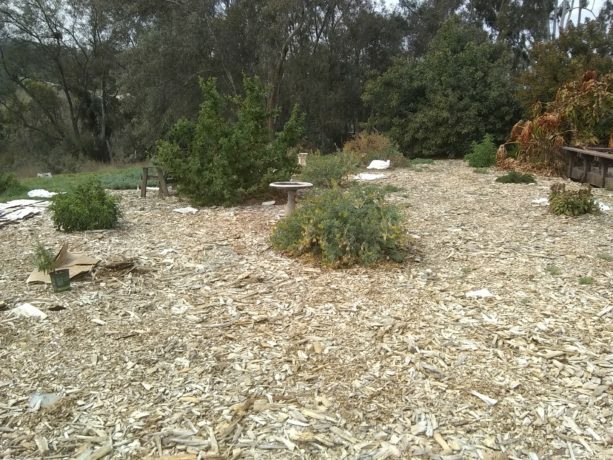 Two years ago friend sheet-mulched her very hard, dry dirt yard using cardboard and newspaper topped with very large chunk free wood chips. 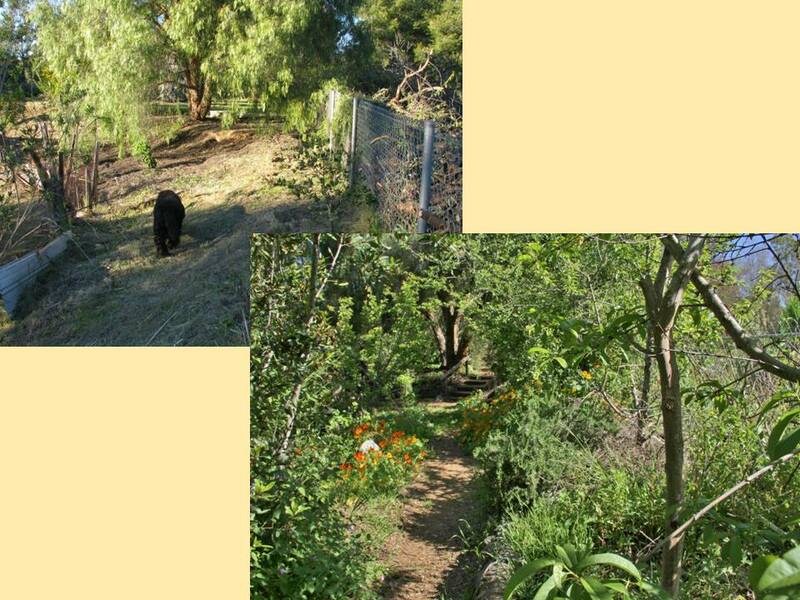 Last year into this were planted a scattering of California native plants. Most of them have thrived, even surviving a frost and many 100F + days. These have been minimally watered. This week in March, after very low seasonal rainfall, we set off to plant more natives. What we found under the mulch was amazing. That light brown dirt was now moist, worm-filled soil. 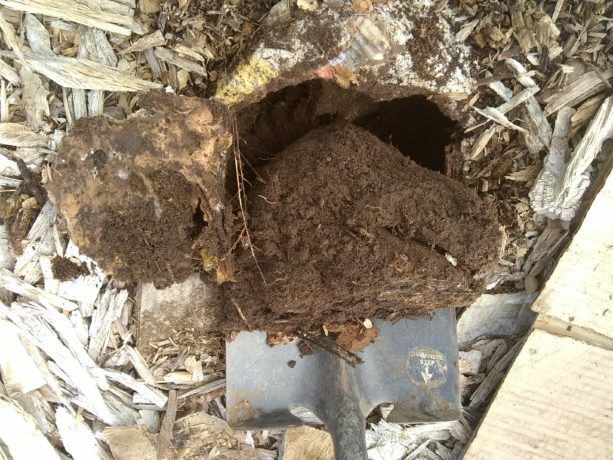 Under what was left of the cardboard were beautiful fungal hyphae breaking down the under layer of bark chunks into a fine surface compost. 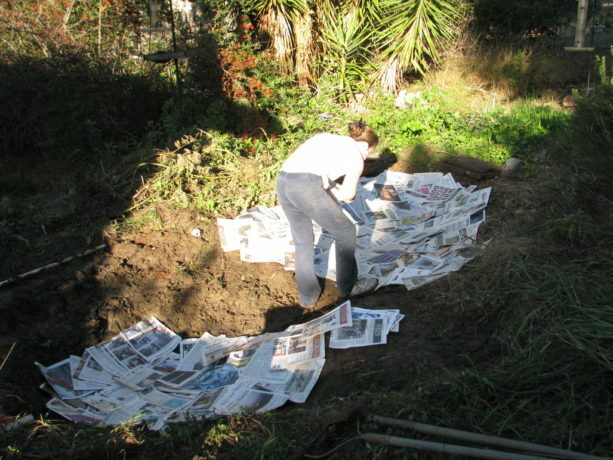 The shovel slide through the newspaper and into the ground making for very easy digging. The soil smelled good and felt alive. 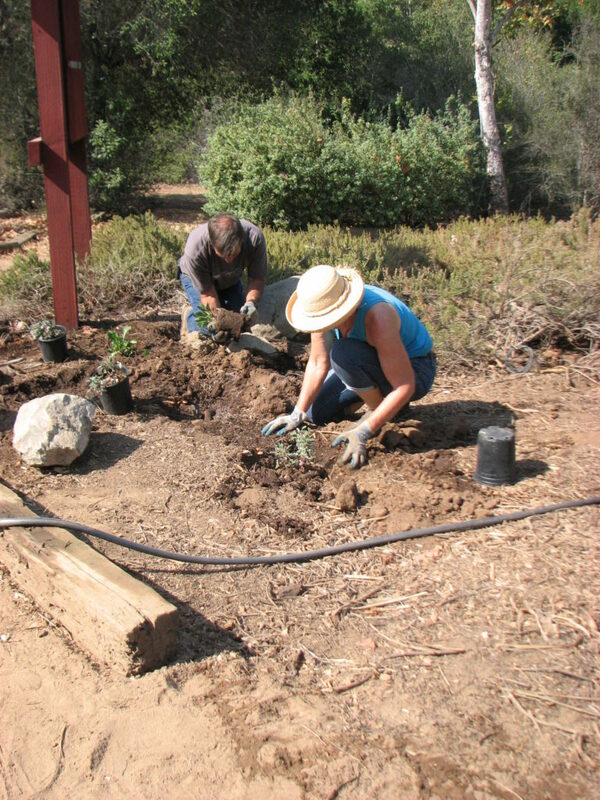 Then we wanted to enlarge the planting area past the mulched area, and it was as if we were digging on another property. The shovel barely entered the dirt, and then hit hardpan within an inch of the surface. We had to chop and scrape holes to plant in. Once we did, we heavily sheet mulched around the plants. Both of these areas, separated by a foot, have had the same rainfall and temperatures, but the mere existence of a thick layer of sheet mulch caused moisture and coolness to be retained, caused protection from hard rain, frost, high heat and dryness, compaction and wind. 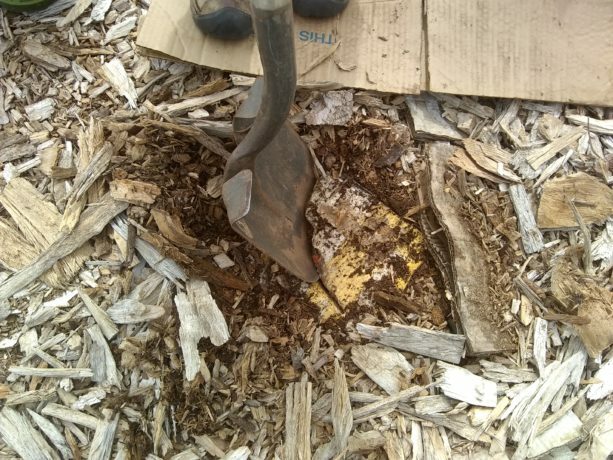 Just this easy combination of waste materials – wood chips and cardboard – made an incredible change in the soil structure and water retention. Last summer when the outside temperature was in the 90’s we dug into a pile of bark chips. On the top the wood was almost hot. Three inches down, it was cool and moist even though it hadn’t rained for months. A difference of night and day. This summer I’ll obtain a compost thermometer and take readings. Leaving the soil bare is like going out in all weather unclothed. Your skin will burn and you’ll become dehydrated in summer; you’ll freeze and also become dehydrated in the cold. In heavy rain and hail you will try to protect yourself by becoming as small a target as possible. Although the soil isn’t cowering, it is being pounded down and de-oxygenated under the onslaught of weather. 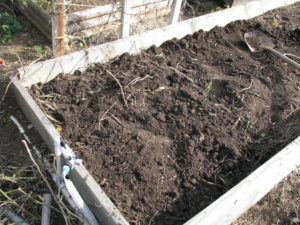 With no air in the topsoil water runs off rather than sinks in. Soil bakes and there is no microbial life in the desert of the uncovered topsoil. The soil freezes and frosts, and microbes are killed; the moisture in the soil evaporating with the coming of spring. 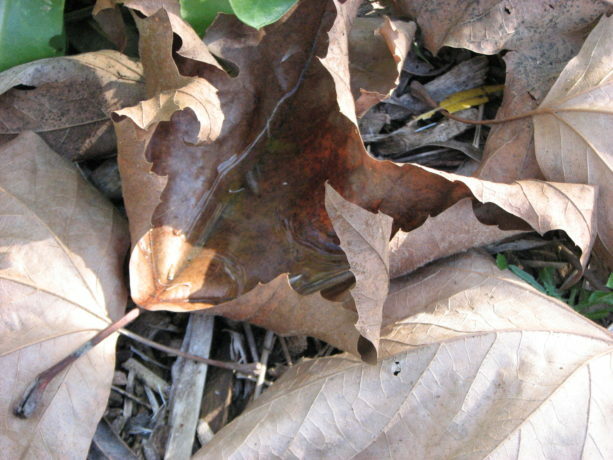 All of this damage is preventable by the application of several layers of mulch, or sheet mulch. You wouldn’t think of being outside for a long time in harsh weather without clothing, so protect your soil the way nature intends, with a carpet of organic matter. The cardboard had gone on top of weeds. No additives were used in planting, such as gypsum, fertilizer or compost. Watering is done on an as-needed basis with a hose. I am always thrilled and awe-struck when, over and over again, I see proof of what simple soil conservation efforts have on soil building. California poppies seeds had been planted in the planting holes the year before, and their seeds have rooted in the bark mulch. Their roots will hold the mulch together and also help change it into soil, as poppies are colonizers helping repair disturbed soil. For the price of a packet of seeds, our friend now has the beginnings of a wildflower meadow filling out the spaces between native flowering plants. 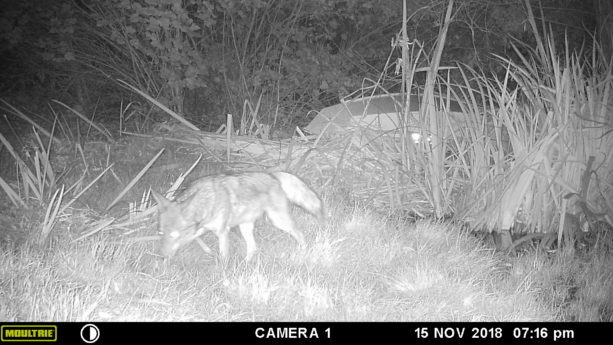 Good soil begins the food chain, beginning from what science can so far tell from microscopic mycrobes and ending in this property at least perhaps at the nesting red tailed hawk in the nearest tree, or perhaps the largest local predator, the coyote. Meanwhile the butterflies and other native insects, and all the song birds, will be on display for our friend’s enjoyment. The sheet mulching will continue on over the slope, and as we plant we mix in pieces of old wood, we plant in shallow depressions in the ground to capture moisture and coolness, we dig a small fishscale swale above the plant to capture flowing water, and we sheet mulch heavily. 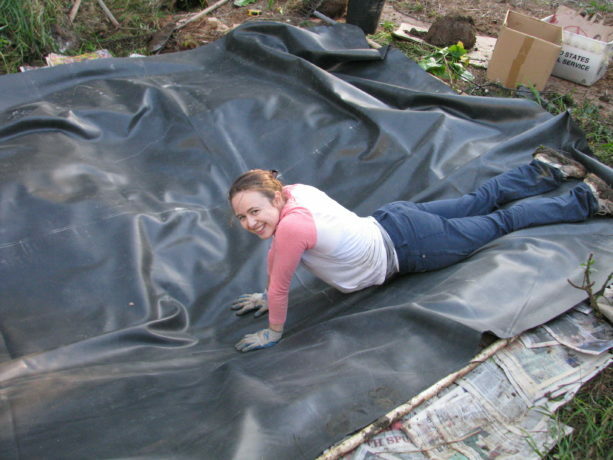 It will be fascinating to keep checking that poor dirt as it regains microbial and fungal life simply through the protection of sheet mulch. Here in Fallbrook, CA, in San Diego’s north county, we’ve had 3 1/2 inches of rain in the past eleven months, and that came overnight several weeks ago. Last year we had a historic 20+ inches of rain which no one was prepared for, as our average is now about eight to ten inches. This year, the plants and animals are in trouble already. The days are hot and dry, with no rain in the forecast for our three rainiest months. I’ve heard people say that they never recommend a pond in a drought, but they can’t be more wrong ecologically speaking. 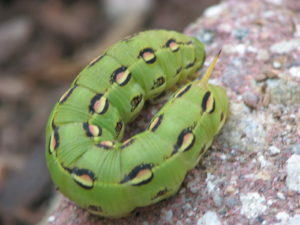 The animals and insects need your help to survive, and they will help your yard with integrated pest management, pollination, soil building, and so much more. Many years ago my daughter and I tore out this big juniper in front of our dining room window and dug a pond. I received a used pond liner, flagstone and some rocks for free from a source that didn’t want them. 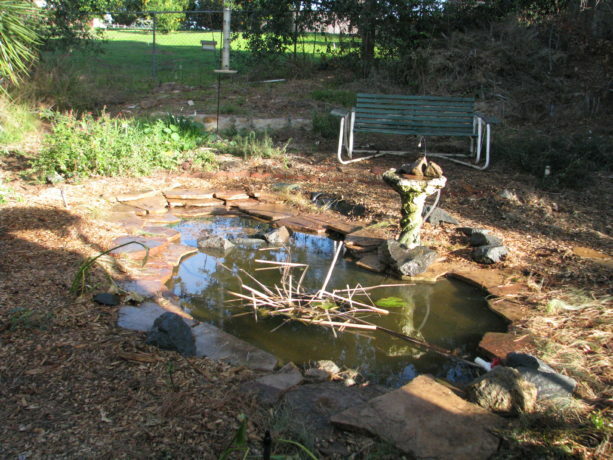 For years I had a lined pond, and I reconfigured it and the flagstones three times over the years. I’ve built new muscles lifting and hauling large, thick pieces of flagstones. With the success of our large unlined pond (blessed with thick clay at the bottom of the property) I wanted to make this little one unlined as well. The benefits would be that I could grow water plants in-ground, and better aquatic creatures could thrive in it. 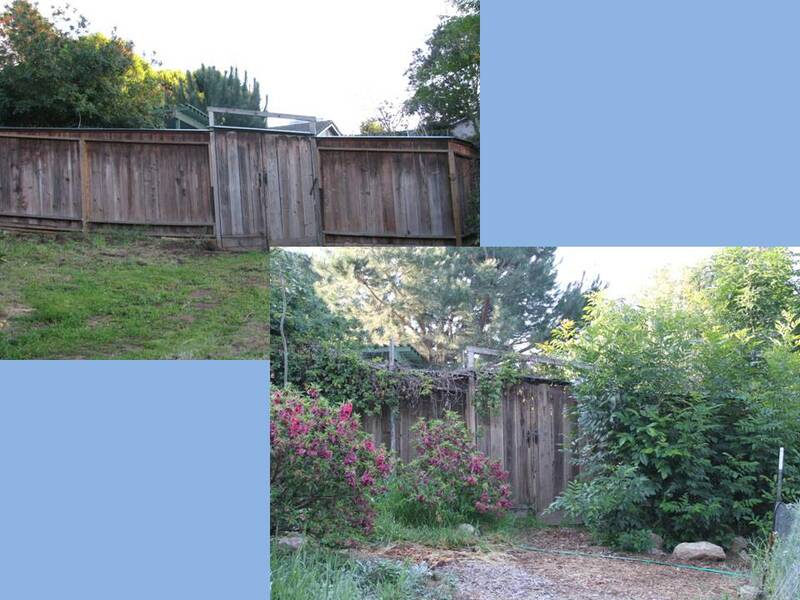 The problem was that up top by the house there is a lot of decomposed granite, which is porous. 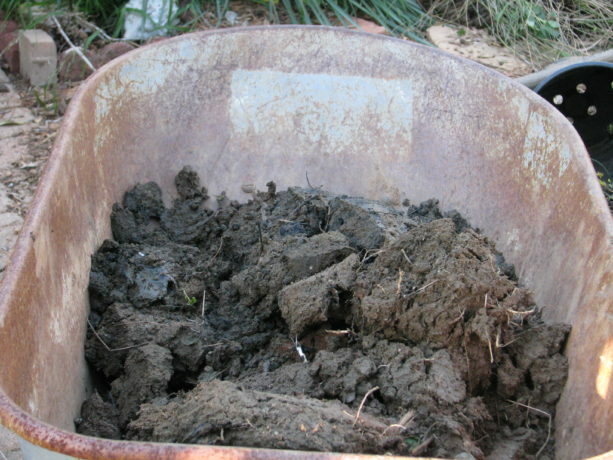 So I spent many a day digging up clay from various areas on the property, pushing the buckets or wheelbarrow uphill through mulch, lugging it over and lining the pond with it. Miranda hauled clay as well. Six inches of clay still didn’t seal it. I’d been refilling the pond every few days with well water, but the level would change dramatically and the Pacific Chorus Frogs that used to come to the pond in great numbers, sing deafeningly in January and February, lay eggs and then go off to eat more bugs in the yard, weren’t coming anymore. The low pond water allowed watercress and other plants to fill it up as well. 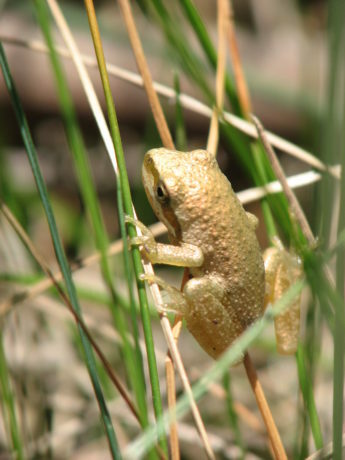 Now it is frog breeding time, and there is little habitat for them. relined it, moved around the flagstones yet again, transplanted a water lily from the big pond below into a sunken pot, transplanted creeping red fescue and a few green lilies around the edges, and installed a circulation pump which allows water to flow through a bird bath. We were finishing the work today, on this balmy, dry, 85F February 1, when Miranda noticed frog spawn attached to floating pine needles. Over the last week while the pond had been full, the magic had already worked! So she corralled the pine needles – fallen from a newly deceased huge beautiful pine in our driveway that died because the neighbor randomly cut its roots in the heat of summer – into the shallow end to keep the spawn safe. Miranda cut some floppy dwarf cattail stems and stuck them into the submerged water lily pot so the frogs could attach their spawn to something stationery. We’d overlapped the edges with flagstone so there were plenty of sneaky places for frogs to hide out. 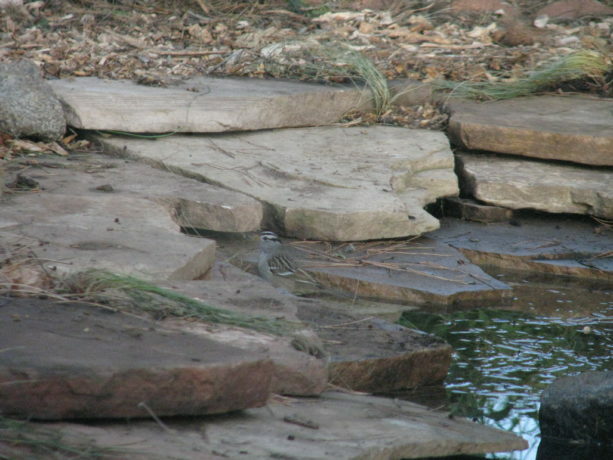 We also have edges of different depths, for different sized birds such as the white crown sparrow below to bathe in, and they have been enjoying these areas immensely. We should charge a dirty bird spa fee! Within half an hour of us finishing outside, while we ate a very late lunch, we had many diverse avian visitors coming in for a drink. 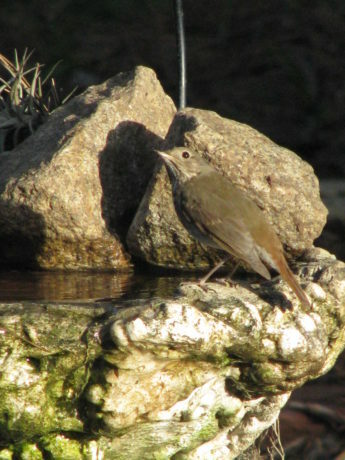 The sound of water carries very far and will attract birds better than food sources. 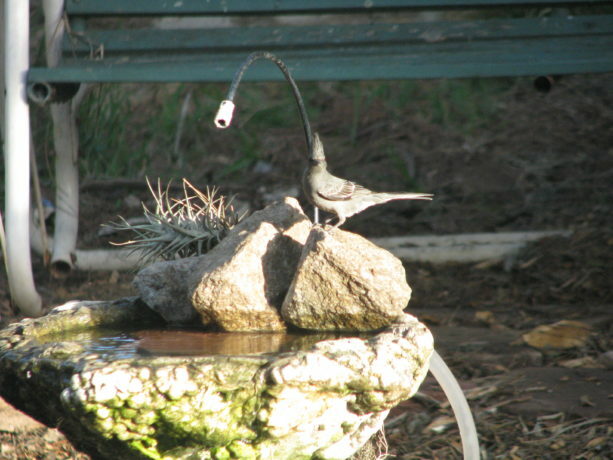 Even a female phainopepla, one of our few crested birds, enjoyed the new running water source. and more. Pond visitors today were also house finches, bushtits, a pair of mourning doves, bluebirds, crows, Western bluebirds, Anna’s hummingbirds, a tanager, Lincoln sparrow, and more. Then when the sun was about to set, the male Pacific chorus frogs gave out a practice singing session, just to see who was in the game for after it got dark. 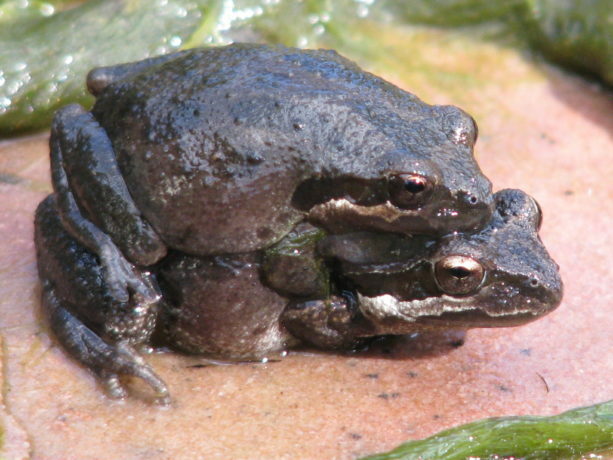 Pacific Chorus Frogs sounding each other out around the upper pond before dark. Its breeding season! 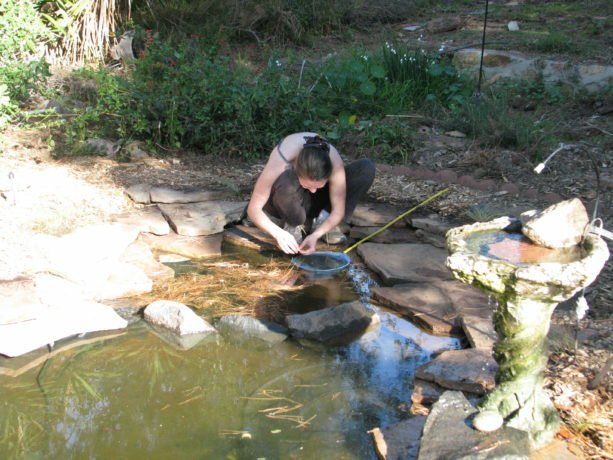 You can make a small pond in a cattle waterer or other metal container, or suspend a big soda bottle over a concave dish and pierce a small hole in the bottom so that it very slowly drips. Provide some shelter for the animals around your watering hole, and you’ll be helping the wildlife get through these extremely dry days. 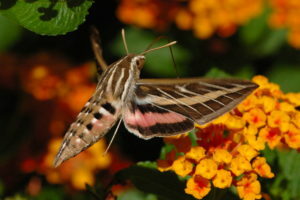 They will respond by eating your bad bugs, building soil, pollinating and so much more. 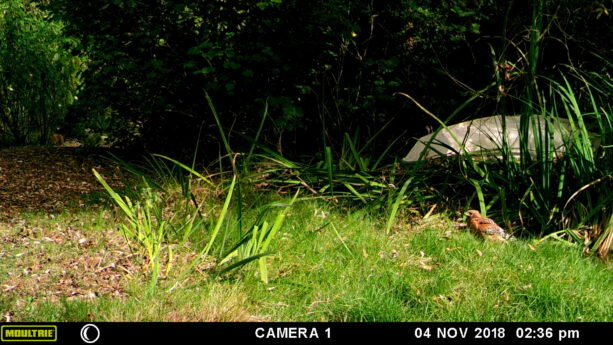 Be sure to watch the action, through a window or via a wildlife camera! Its better than TV, and no commercials. Take on one project this year that will help improve the earth. Just one. If you can manage more, fantastic. However make sure that you are fully mindful of all aspects of your project so that is it done as well as it can be. For instance, decide to use greywater. 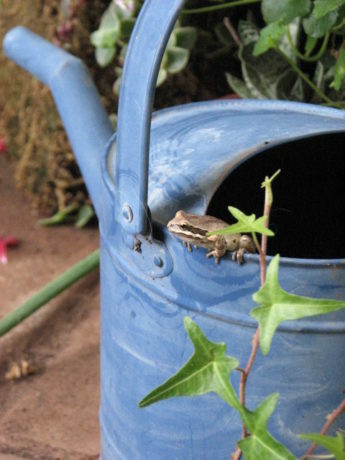 If you can physically and legally connect your household non-toilet water pipes to a water composting system and use it to irrigate plants, then do so. If piping is impossible, then hand-carry the dishwater, shower water, bath water and cooking water out and dump it on your plants as often as you can. Make a smoothie for yourself, then clean the blender by filling it with water, blending it, and pouring that nutrient-rich residual around your plants. Yet that is not enough. Use environmentally friendly soaps. Be aware of the plastic content and chemical treatments for fireproofing or insecticide of the clothes you are washing. Plastic is in synthetic fleece, in microdermal skin treatments, in polyester bedding. You don’t have to not use greywater if you are washing synthetic fabric, but you should be mindful of what you buying. Avoid microbeads. Avoid glitter and mosquito-proofed outerwear. Choose your purchases with open eyes, thereby reducing your usage of these toxins. Build good soil to help clean the toxins from the water. Compost. 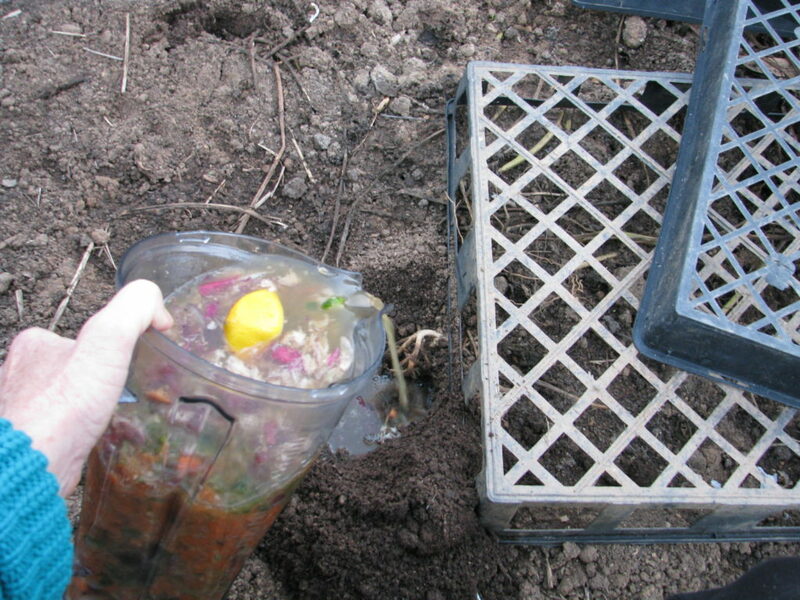 At the very least, use blender compost. 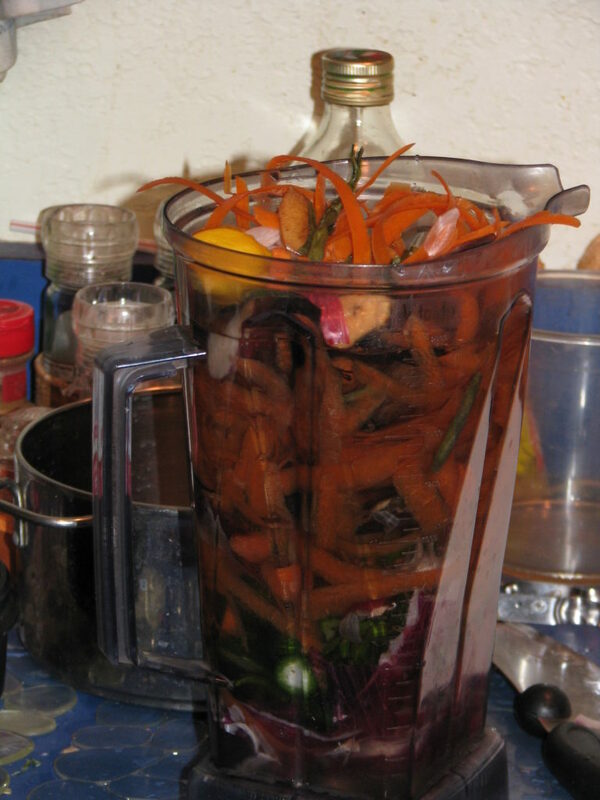 That means, take a handful of soft kitchen scraps, put them into a blender, fill with water, process, and pour the very liquidy mixture around your plants. Don’t throw away any food scraps, egg shells, leftovers, sour milk, moldy refrigerator mysteries, paper towels, tissues, paper napkins, cotton Q-tips, cotton balls, cotton dental floss, hair, or anything biodegradable. If you can’t blend it up and pour it onto the earth as fertilizer, then dig a small hole and bury it, or make a pile and compost it, or layer it in a raised bed or in a lasagna garden. What leaves your house in the form of trash should only be recyclables and undecompostable items. 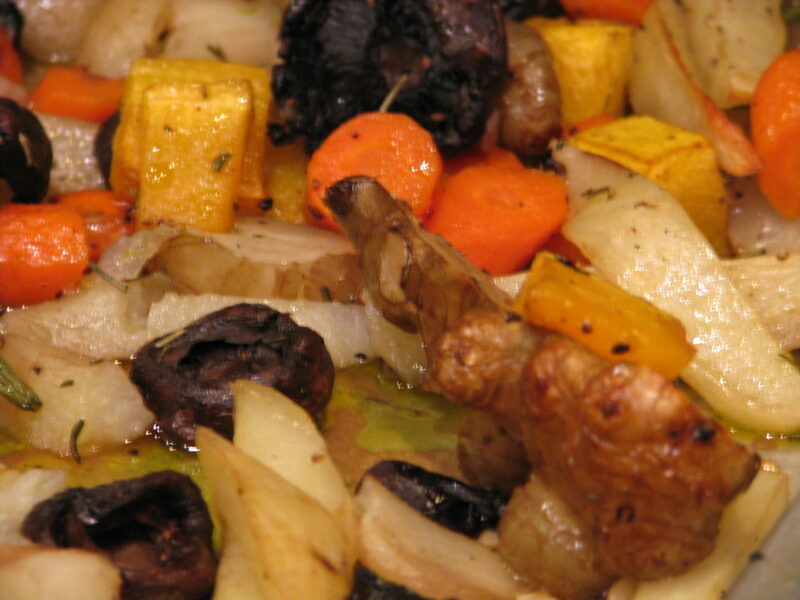 Your garbage disposal should be rarely used if ever. Put this raw fertilizer into the ground, not into the dump. Be mindful of what you are buying and whether it can be composted or not. Plant trees. If you are in an area with too much rainfall, you need the trees to take up the water, hold the soil and buffer the onslaught of the weather. If you are in a dry area you need trees to shade the ground, to capture ambient moisture and rain it down, to cover the hard earth with leaves. All areas need perches for animals. All areas need the oxygen supplied by the trees converting carbon dioxide gasses. All areas need reforestation with natives that thrive in indiginous locations. Be mindful of what kind of landscape you are planting. If you choose non-native trees that offer no food for animals and harm the native flora, then you are not helping. 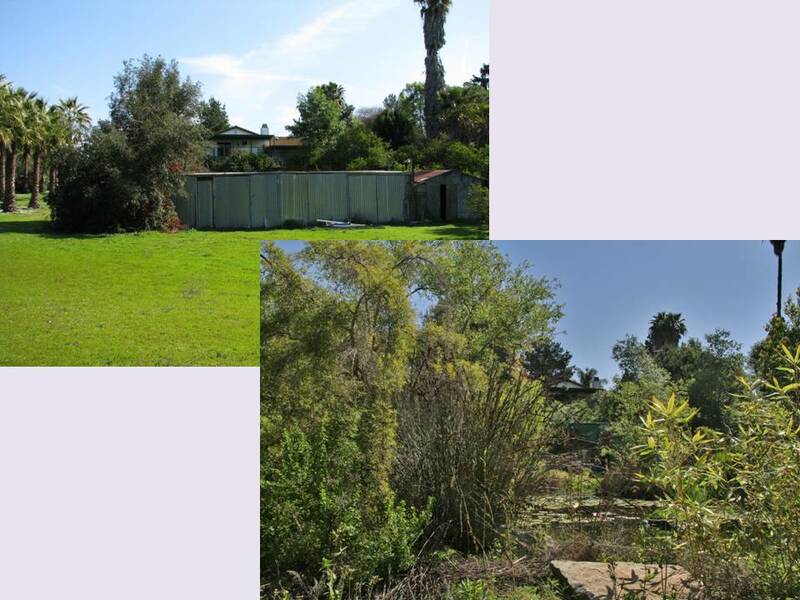 In San Diego, if you plant eucalyptus, ficus, Washingtonia palm trees, Brazilian or California peppers (not from California, but Peru), or many of the sterile fruitless versions of ornamental trees, you are taking away from the landscape rather than adding to it. I can’t begin to count how many neighborhoods I’ve been in with old plantings of ornamental plants and trees, and the area is so sterile of animals that they are like wastelands. Only survivor crows and sparrows (and loose cats) can be seen. 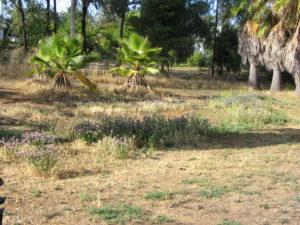 Instead, areas with native trees are rich in many species of birds, and the insect population is under control as well. 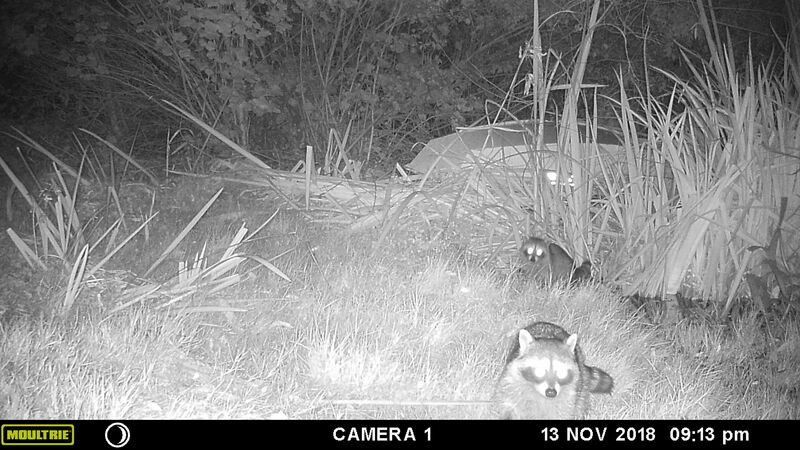 Water use is low, pollinator habitat is high, and the neighborhood feels alive and well, especially if the cats are safely tucking inside where they belong, as mine are. Recycle. I am constantly stunned to see recyclable bottles and cans thrown into regular waste. The percentage of what is recycled that actually processed is low, too. So choose glass over plastic. We bought camping utensil sets to carry with us, refuse straws, and this year I’ll work on bringing containers for leftovers when we eat out rather than take a clamshell plastic container or Styrofoam one. I already wrap banana peels, leftover pastries, apple cores, and whatever is biodegradable in a paper napkin, bring it home and compost it. If you have a plastic water bottle, soda can, glass bottle, or anything recyclable, please put it in the appropriate container. Recycling has been around since I was a schoolgirl, and I can’t believe everyone still doesn’t do it. Switch makeup. My daughter is particularly good at finding vegan, Fair Trade and non-GMO skin care products for reasonable prices. Neither of us use many cosmetics, but the lip and cheek color, eye color and moisturizers we use, as well as our daily soaps, are ethically and environmentally sourced. Why rub harsh chemicals into your eyes and mouth? The choices grow every day, and the prices lower all the time. Do your homework. Be mindful of what you pick up in the store. Remember that what you put on your skin is also washed down the sink and into the water table, or into your greywater. Support the businesses who have ethical business practices. This goes for men, too. Shaving cream, after shaves, toner, scent, hair products, etc. Your skin will be healthier for the change. Shop local. Pick one or two local businesses that you know practice sustainable, ethical and conscientious business practices, who give back to their community, and give them all of your support. Buy from them, advertise for them, befriend them, give them moral support. Rate them highly on Yelp, Google, or other rating systems. Watch out for them to be sure that they can succeed. Work for them if possible. Adopt them so that they have success. Go animal and dairy free at least one day a week. I cannot go into the scope of the damage to the environment and the horror of the treatment of food animals here. Dare yourself to find out for yourself. Read Michael Pollen’s The Omnivore’s Dilemma. Find out what happens to cows and their calves in dairies, and the heartbreaking lowing of the cows -always kept pregnant to produce milk- as their young are hauled shrieking away to be slaughtered for veal. If you think that fish and shellfish somehow have no nerves or instincts, then think again. Lobsters who are by nature competitive being held in freshwater tanks, their claws bound, among their competition, starved, and then boiled alive. If you shrug and turn away from the suffering from others, then perhaps you should analyze your food sources more. You condone practices if you support them with your wallet. So set aside a meatless and dairy-free day once a week. If the entire U.S. did not eat meat or cheese for just one day a week, it would be the equivalent of not driving 91 billion miles – or taking 7.6 million cars off the road. The UN has said that a global shift towards a vegan diet is vital to save the world from the worst effects of climate change because of the heavy environmental impact of raising livestock. Not to mention the health benefits that come from a plant-based diet; diabetes, cancer, hypertension, high blood pressure and so much more is rooted in diet. Make a Meatless Monday, or a Vegan Wednesday, or whatever, and avoid pouring cheese sauce all over some steamed veggies and calling it a good meal. Have a curry, a Turkish Eggplant Stew, a dairy free mushroom stroganoff, spring rolls, veggie lasagna, heavenly steamed eggplant, a portobello sandwich, stir-fry, bean and avocado burritos, try some non-GMO meat substitutes like those from Gardein (particularly their fish!) (no product placement, just a recommendation), or make your own seitan. Make your own vegan butter. Let your body and the environment have a break for a day. Help Out. Choose a local charity, or a needy neighbor, and provide what they need. Don’t just give them what you want to get rid of , or what you think they should have. Often people just need reassurance or a friend to talk to, or possible solutions, or a hand for a day. Donate what your charity needs, and if that is money then do it. Help with a fundraiser. Volunteer your time. Do something to truly help someone else out, without asking for praise or cosmic bonus points in return. Don’t be a pain; be a blessing. Volunteering and helping out make you feel worthwhile and surrounds you with like-minded people who can become your friends. I have found many of my closest friends through volunteering. Be aware of large, nation- or world-wide charities who use most of your donations for salaries and infrastructure, and very little on what they are supposed to be supporting. Don’t let the big names fool you. Use your money to help honest charities in your area, or by just sending money to people who need it, anonymously. Whatever you choose to do, do it mindfully. Pay attention to the details, to where products come from, to the business practices of the charities and stores you support, to how animals and people are treated in the making of the products, of what is in what you handle every day. You don’t have to, nor can you, take on the world’s problems, but you can focus on one thing and stick with it; make it part of your day-to-day until it is habit. Then move to a second choice. What you do, what you buy, what you say and how you spend your time cause ripples across the earth, and being mindful of your influence will send out help rather than harm. Happy New Year. Be healthy. Be kind. Be happy. You matter. Guess what we picked today? I’ve just finished freezing the large ones to make into tomato jam and tomato sauce later, or seasoning and setting the smaller ones out to sun dry. We’ll sell these fantastically tasty foods at our Marketplace in November. Last year, 2016, we had no tomatoes until the Fall. I couldn’t figure out why. Our summer temperatures were over 100F for days on end, peaking at 116F several of those days. The nights never cooled off and sleeping was difficult. It turns out that the tomatoes didn’t like the heat either. If temperatures consistently stay over 85F and don’t dip below 75F at night then the flowers won’t set fruit. 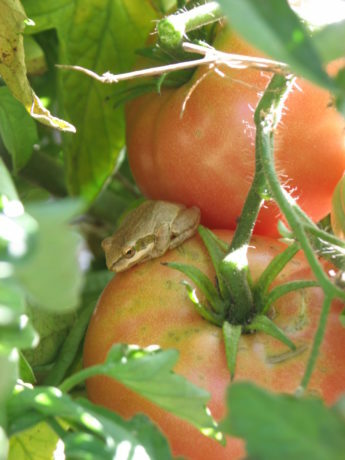 And here I was thinking that tomatoes loved the heat! They just love the warmth, like I do. Tomato flowers are self-pollinating. Each has both male and female parts and it takes vibration from winged insects and gentle warm winds to pollinate. Others flick them with their fingers, or set a tuning fork on them to simulate insect vibration. If there are very hot, dry winds, pollen dries out and isn’t viable. If the humidity is so high that it is sticky out the pollen swells and sticks, unable to fall to the female part of the flower. 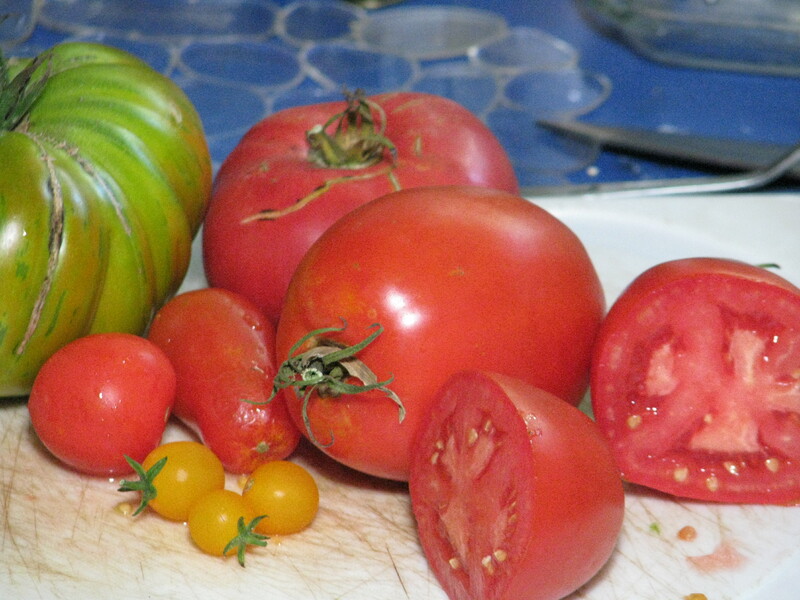 When the temperatures lowered in the Fall, even though the day length was shorter, the tomatoes quickly put on fruit. Here in Southern California’s inland area we don’t receive snow, so tomatoes can last outside as a perennial vine for several years. However a good way to keep tomatoes for use after summer is to prune it, hanging the vine with the tomatoes in a dry area with good air circulation. 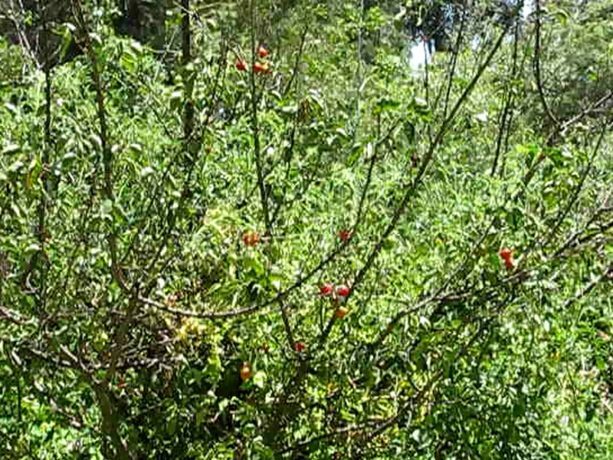 The vine will die but the tomatoes – especially sauce or paste tomatoes such as Roma – will stay in excellent condition for months. 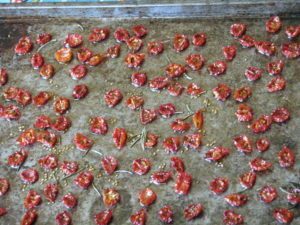 Tomatoes enjoy a good deep watering, and then let go dry in between. The tomatoes are more flavorful that way as well. Most of the tomatoes we harvested today came from volunteers that had popped up along our fenceline and receive no water, and others receive water once or twice a week along with the trees by which they are planted. This apricot tree has been struggling with the heat and heavy clay in which its been planted, and as it has too few leaves there isn’t anything protecting the trunk and branches from the scorching heat… except for this tomato plant. 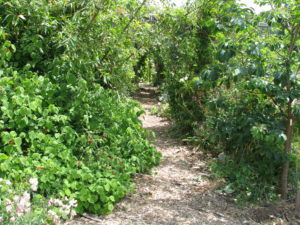 The tomatoes vine upwards away from nibbling animals and are easy to pick, and the apricot receives shade. (Remember that growing under trees that have an upward growth is great, but only grow companion plants outside of the dripline of trees that have heavy skirts such as citrus and avocado). 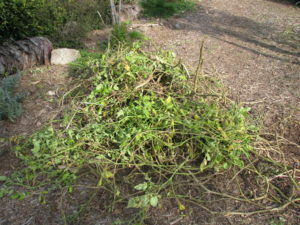 When tomato vines die down, cut them at the soil surface and then either bury them or cover them with compost and then plant right around them. Worms love tomato vines and roots, and the vines will return nutrients to the soil. Also, tomatoes don’t care about being planted in the same place twice, so don’t worry about crop rotation. The only issue you might have is that if you plant a different variety the following year, seeds from the previous year’s tomato might come up there as well. 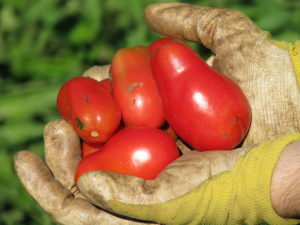 If your tomatoes crack on the vine, that usually means too much water, or that you’ve dumped some fertilizer on them and the growth spurt was too quick for the expanding fruit. Don’t use chemical fertilizers. Period. For anything. If you dose the tomatoes with fertilizer you’ll have lots of vines and little fruit. Also, if the tomatoes have blossom-end rot (round black dents in the bottom of the fruit) it means there is a calcium deficiency, so to prevent this bury crushed egg shells where you’ll plant tomatoes, or pour sour milk or milk products around the tomato plants. a large lovely moth that you may see in the night. 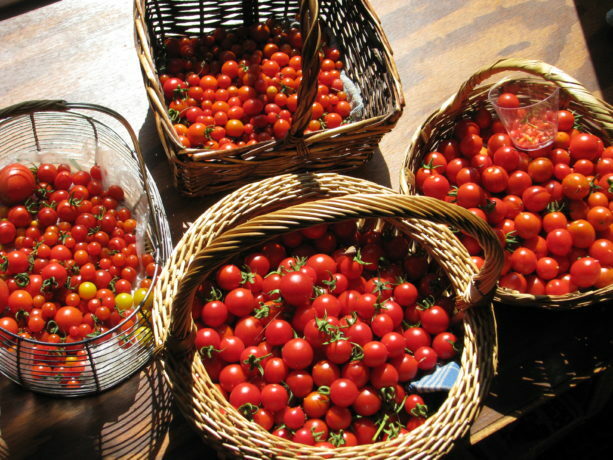 If the temperatures remain tolerable this summer, we here at Finch Frolic Garden can look forward to lots of tomatoes to dry, can, freeze, eat fresh, make into sauce… whatever. 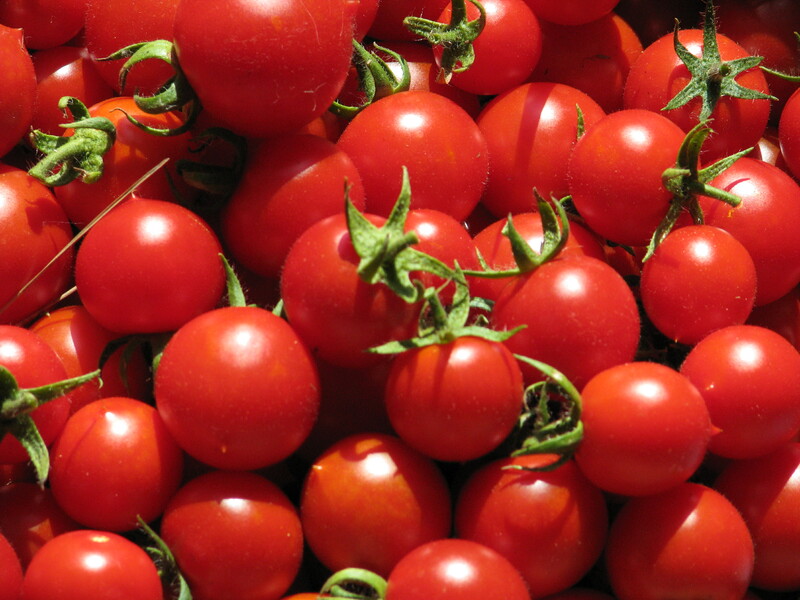 Tomatoes are truly the taste of summer. In drylands there is a noticeable lack of trees. This situation is kind of a Catch-22. 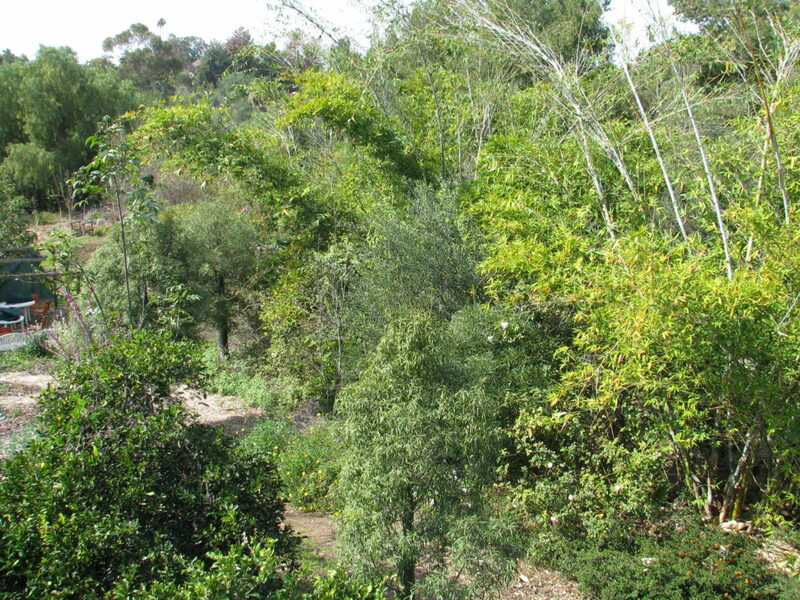 The hotter and drier it is, the less water there is in the ground to provide for plants that can attain height, and the more the leaves of the existing trees must adapt (become smaller) to prevent transpiration and sunburn. Yet the very lack of trees and their extensive root systems, and the shade and habitat they create, and the transpiration that allows humidity to keep the air moist for pollen to survive, is one of the causes of desertification. So how do we stop this cycle? First, work on a manageable area. If you have a large property, then start on the area closest to your home or where you need water the most, or where water settles. As in the Annie Lamont title, Bird by Bird, you work on a piece a little at a time. 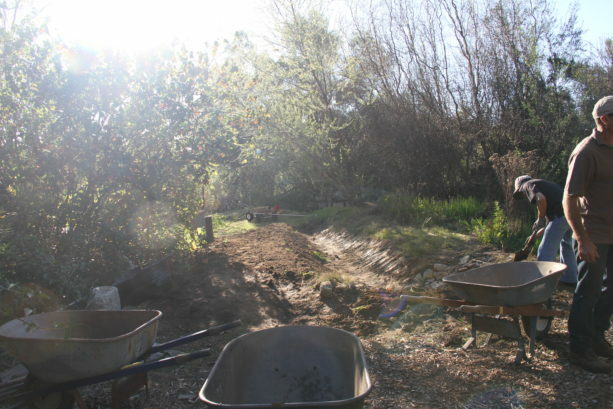 Put in earthworks to harvest rainwater. 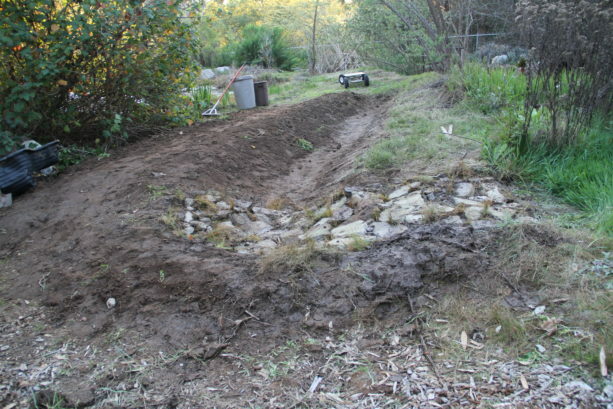 Simple swales or rain catchment basins, perpendicular to the water flow and on contour with your property, will harvest hundreds of gallons of water each rain. You can do them with tractors, you can do them with shovels, you can do small ones with trowels above small plants. Just do them. Bury organic matter: hugelkultur. Do you have old wood laying around? 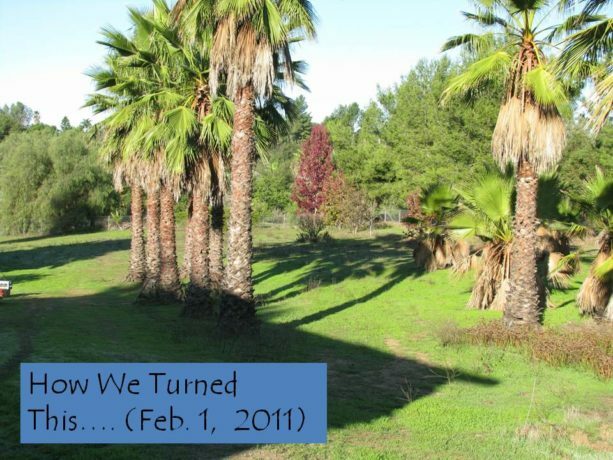 Palm trees that are growing and being a fire hazard? Old untreated lumber full of nails? Branches? All of this can be layered into the ground. Bury organic matter downhill from your swales. If you cannot bury, then pound sticks vertically into the ground. 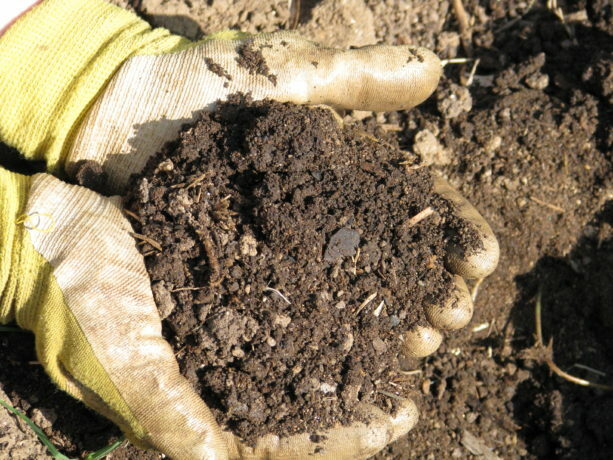 The important thing is that you are adding organic material back into your depleted soil. It will hold rainwater, it will activate soil microbes and fungi, it will open oxygen and nutrient channels, it will sequester carbon and make it available to the plants. Our soil is mostly just dead dirt. By layering organic material with dirt you are doing what nature does, but at an accelerated pace. 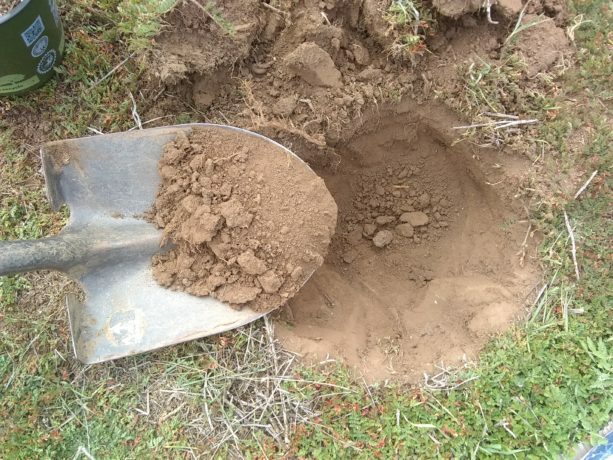 If your soil is unmanageable, or you can’t dig, then layer on top of the soil. Its called, among other things, lasagne gardening. Lay out newspaper, top it with fresh grass clippings or other greens, top that with dried grass clippings, dried leaves or other ‘brown’ materials, and depending upon what you want to plant in this, you can top it with mulch or with a layer of good compost and then mulch. Then plant in it! You create soil on top of the ground. Mulch and sheet mulch! Protect your soil from the heat and wind, and from pounding rain. 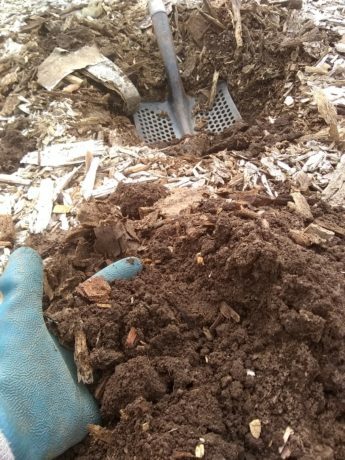 A thin layer of bark will actually heat up and accelerate the evaporation process: add several inches of mulch to the ground. 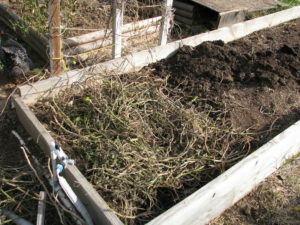 Better yet, sheet mulch by laying cardboard and/or newspaper directly on top of the weeds and layering an inch or more of mulch on top. This can be free mulch from landscapers, old weeds, grass clippings, animal bedding, softwood cuttings… just cover the soil to keep it moist and protected. 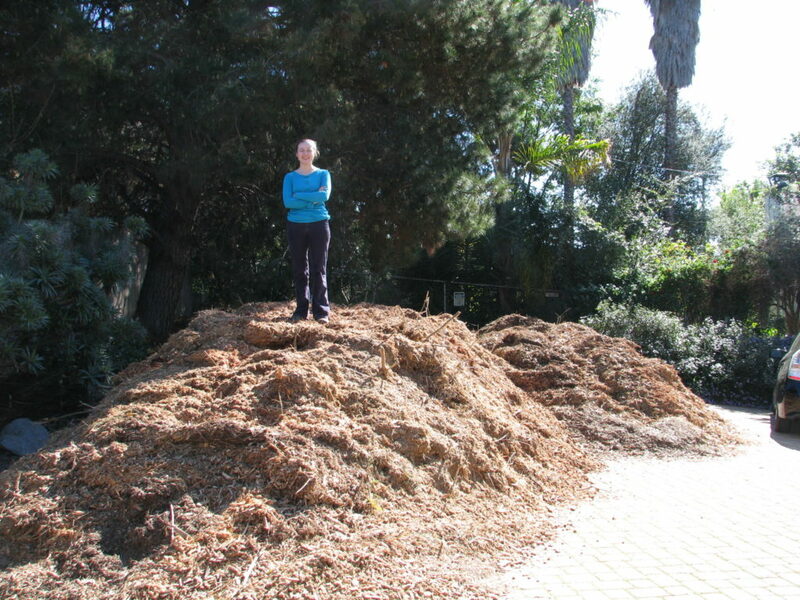 Thick mulching alone will help keep some humidity in the air and begin soil processes, as well as reduce evaporation by reflected heat that comes from bare earth or gravel. Plant native plants. They thrive in our soil. Grow trees that filter the sun and don’t like a lot of water, such as palo verde, or those that take minimal additional water such as desert willow, California redbud, valley oak, or others. 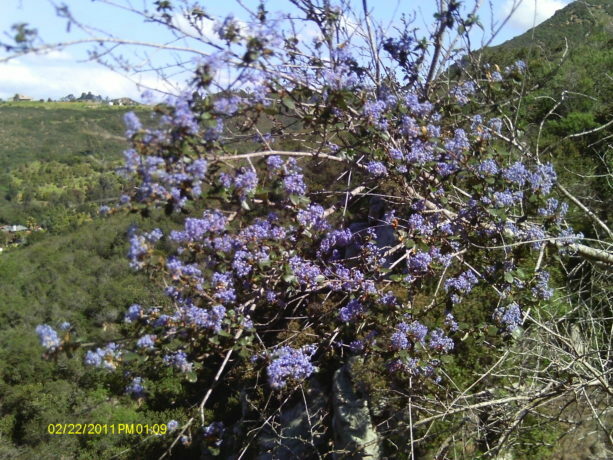 Grow tall bushes such as toyon, lemonadeberry, sugarbush, quailbush, ceanothus or others. Use these wonderful plants to invite in birds,butterflies, lizards and other wildlife that will begin pollination and help activate the soil. Design your garden for what you want to grow besides natives. Fruit trees? Vegetables? Ornamentals? They can be arranged in your mulched area in guilds to grow cooperatively. Grow shade. 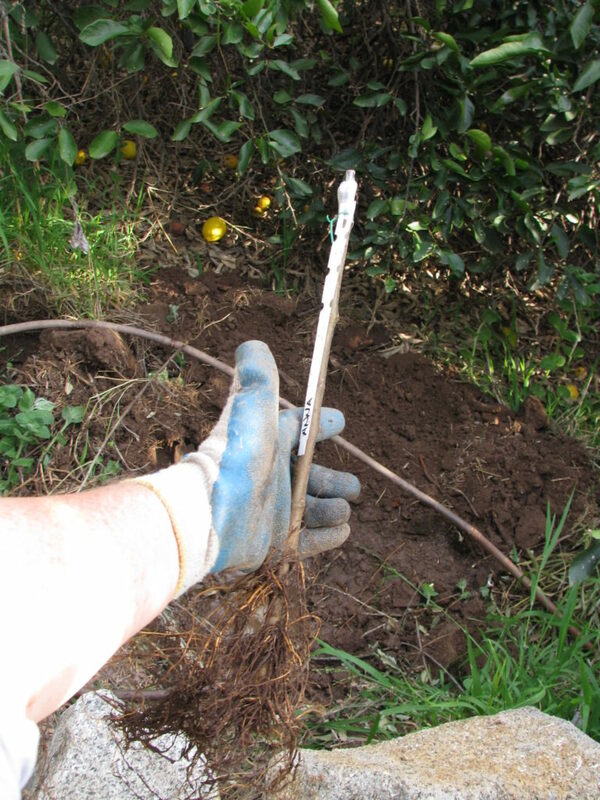 Fast-growing trees and shrubs are invaluable for protecting – ‘nurserying in’ – less hardy plants. Acacia and cassia are both nitrogen-fixers and will grow quickly to shade your plants, can be cut for green waste in the fall and also attract pollinators. 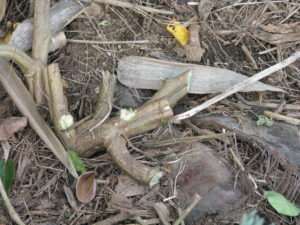 Moringa is completely edible and is also an excellent chop-and-drop tree. There are many others. You need to protect what you plant from the harsh summer sunlight, and using sacrificial trees and shrubs is the most productive way to do it. Protect your tree trunks from scorching by growing light vines up them, such as beans or small squash. Once you have done this process in one area, then move on to the next, like a patchwork quilt. These areas should all be planted in accordance with a larger plan that covers your entire property, so that you plant what you want in the best possible place. 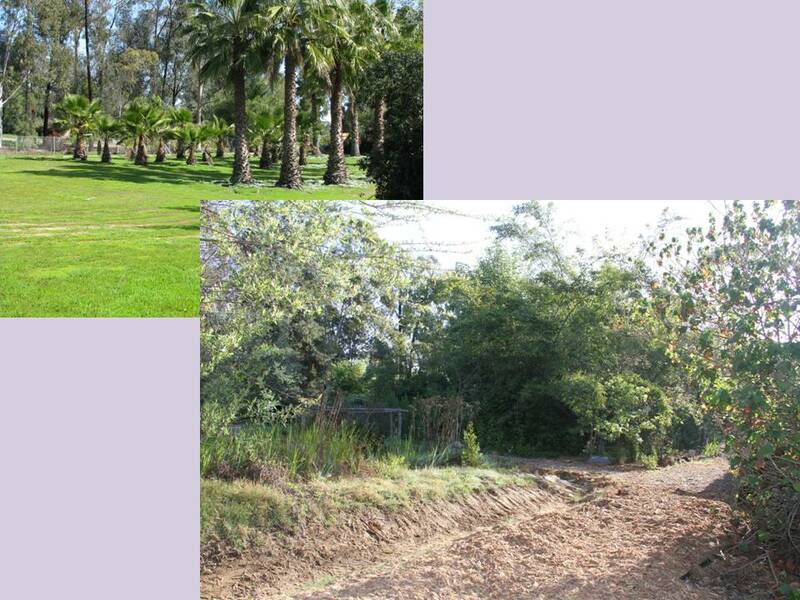 However, the earthworks, hugelkultur and mulching can be done everywhere. 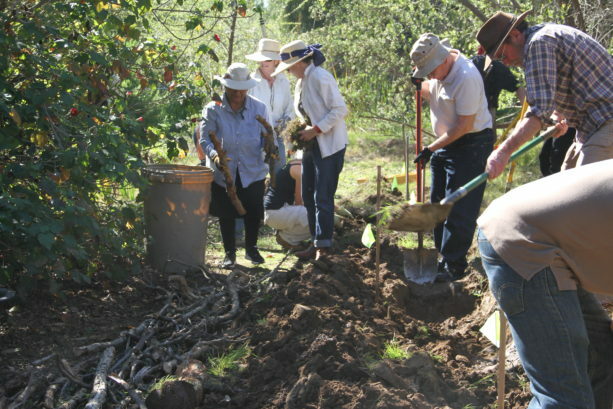 By following these guidelines, and working one small area at a time, you’ll have success, have trees, shade, food and be helping reverse desertification, one plot at a time. 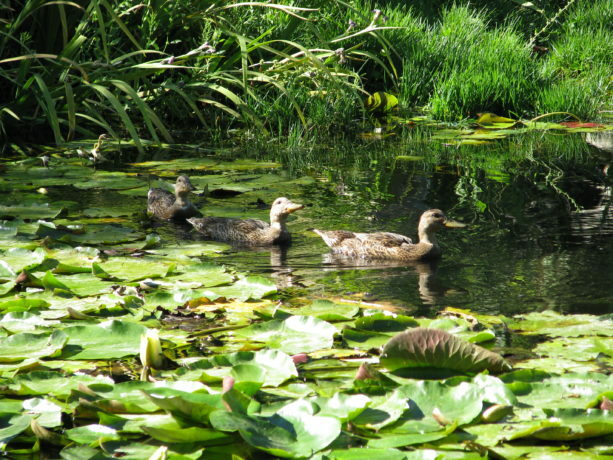 Every year our two wild mallards linger in our chemical-free pond. 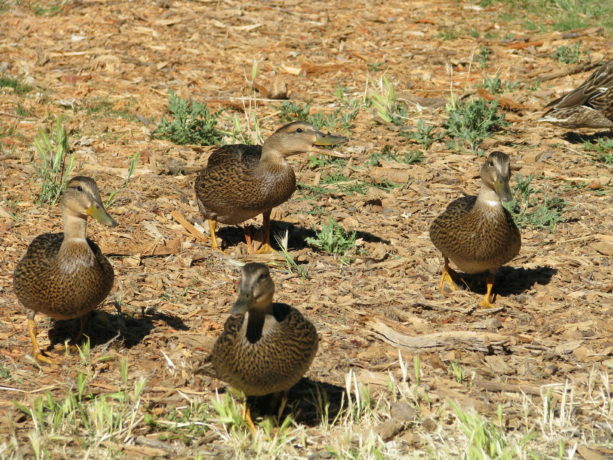 They mate, Mrs. Mallard disappears for awhile, returns with very small ducklings and… they all die within days. Why? She hasn’t been a great mama. She runs them around too much, doesn’t preen them or give them time to eat. So this year when she showed up with four ducklings I didn’t even want to take photos of them. Who knows how many she began with? 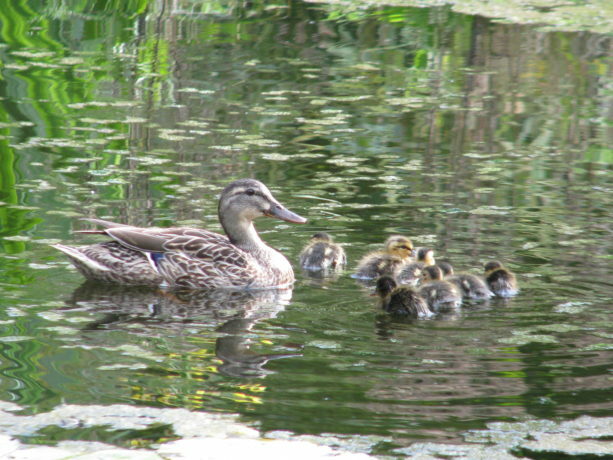 But these ducklings were a little older and larger than other batches had been. And they survived. 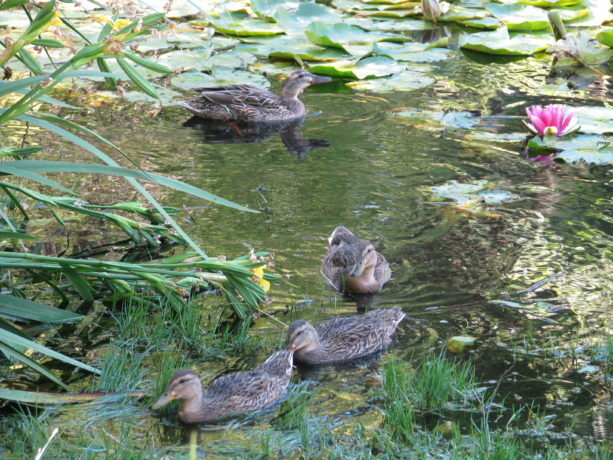 They weren’t eaten by the bullfrogs in the pond, or snatched by birds, or neglected by mama. 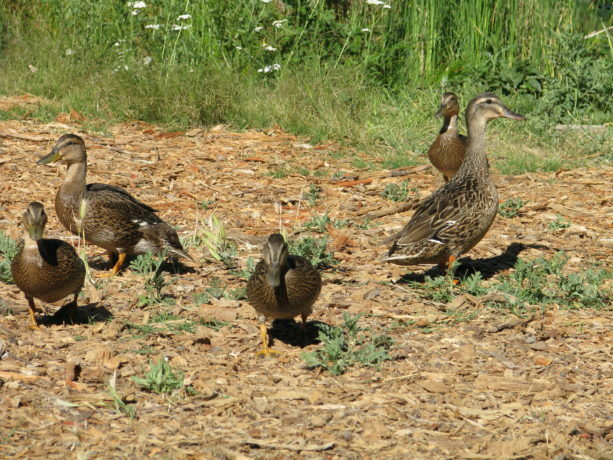 We put out wild game bird food to help them along, but Mrs. Mallard has taught them how to dabble for vegetation (they eat mostly greens).The ducklings make a ‘weep-weep’ sound when they are asking for food. 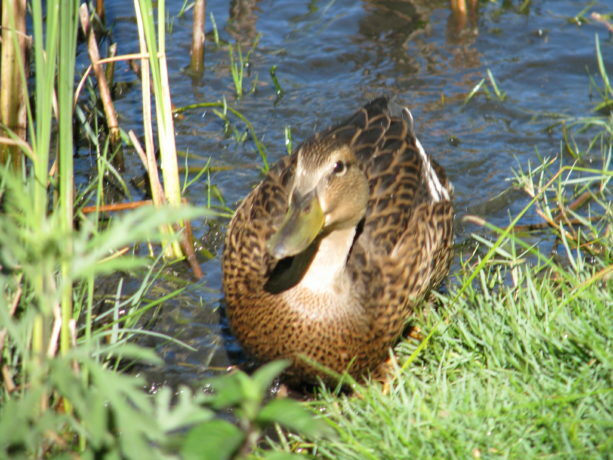 One day she repeatedly dove and came up under them, and then swam underwater to the other side of the pond and back: she was teaching them how to swim underwater! Now these babies have lost their downy feathers and are growing in their primaries. They’ll be off soon, hopefully to return. Mr. Mallard has been keeping an eye on Mrs. Mallard; he sometimes pushes the babies out of the way of the food, for which we chastise him greatly. His breeding plumage is holding so if the young fly off soon, he might try for a second mating this season. 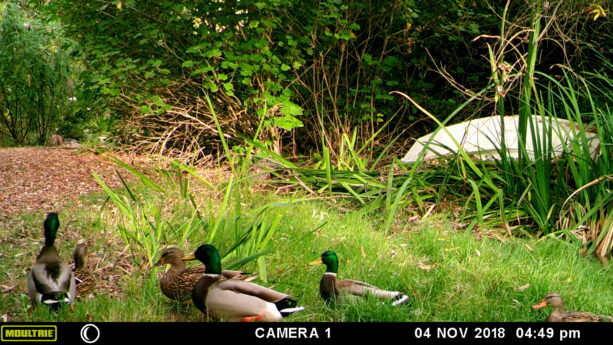 Meanwhile, Mama Mallard looks pretty smug. Over 97% of California’s wetlands are completely gone, and what’s left is compromised by roads, pollution and management. Those billions of animals and trillions of insects which depended upon those wetlands have mostly died off, or make do with chlorinated water from the billions of swimming pools and bird baths they can find. The wildlife you see is a tiny remnant of what should be here. To have a pond with rain water or well water in it, cleaned by fish and plants rather than chemicals, is to have a haven for wildlife. 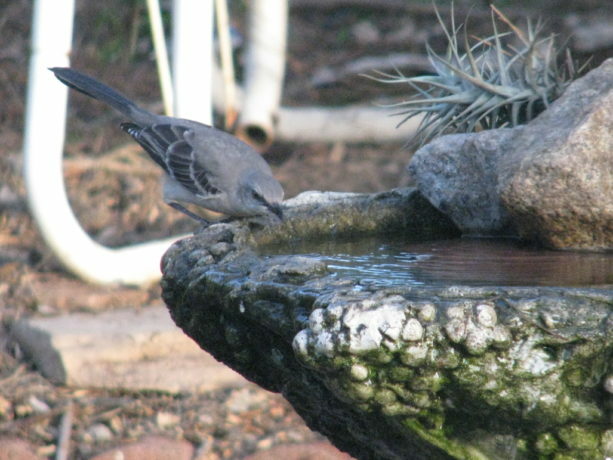 Good water is diverse with life, just as good soil is, and instead of drinking wet chemicals animals can drink water that is imbued with nutrients. 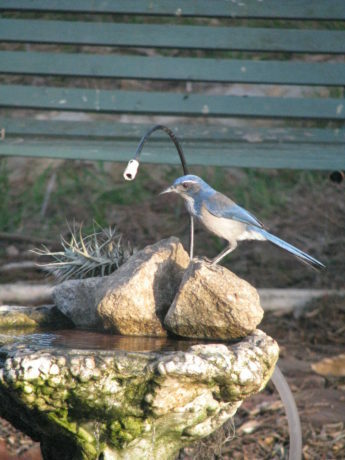 The thousands of insects, reptiles, amphibians, mammals, marsupials and birds that use our pond are healthy because the water is not chlorinated. 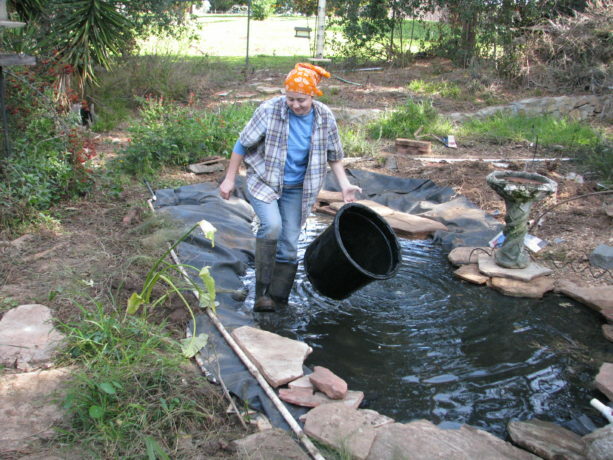 If you can put any size of pond – even in barrels – using rainwater and cleaned by plants and fish, you’ll be doing wildlife and yourself a service. 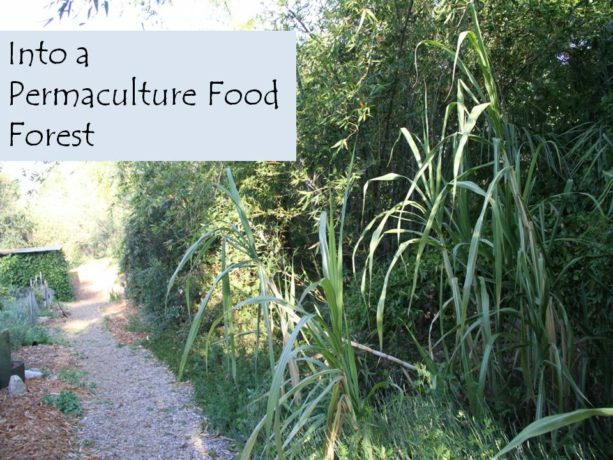 In February, 2011, I signed the contract with Roger Boddaert to create a permaculture food forest. 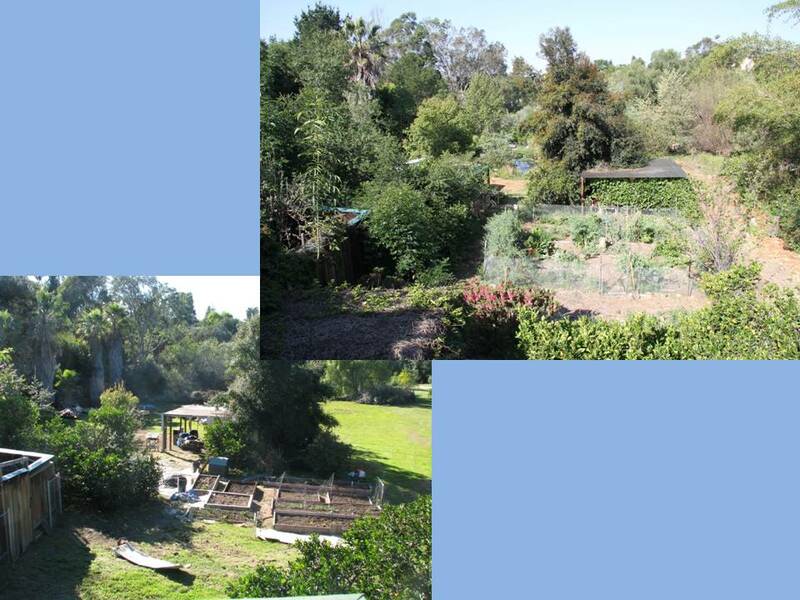 The goals at that time were to stop the erosion on the property, to create a wildlife habitat, and to grow food, medicine, native plants, building materials, herbs and ornamentals in a sane way: no chemicals. So the journey began, and it hasn’t been easy. Nor did I at that time know that the garden would evolve into Finch Frolic Garden and my business would be education. 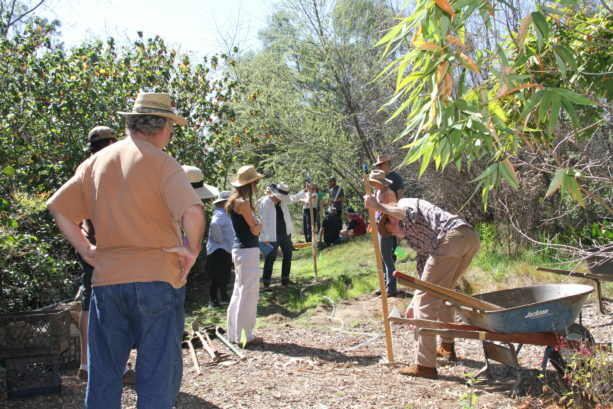 Last Saturday we hosted our first workshop of 2017, featuring Alden Hough of Sky Mountain Permaculture. 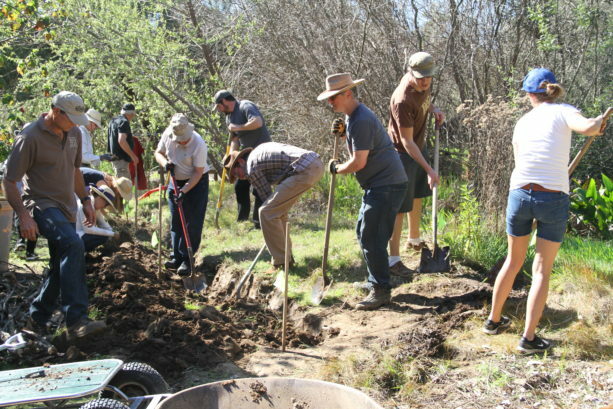 Alden is a master at creating earthworks, and he spent three hours here at Finch Frolic Garden teaching a class of sixteen people how to install swales correctly. The project was a small pond that overflowed and flooded when heavy rains hit. 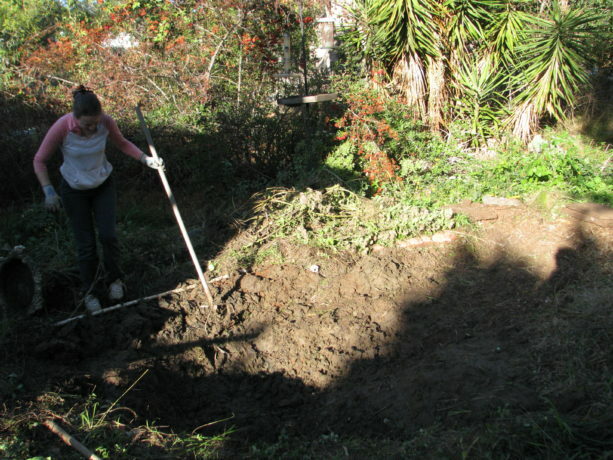 The soil is heavy clay and therefore the small pond doesn’t percolate. It is kept filled by the well, and its overflow feeds the bog and the big pond. 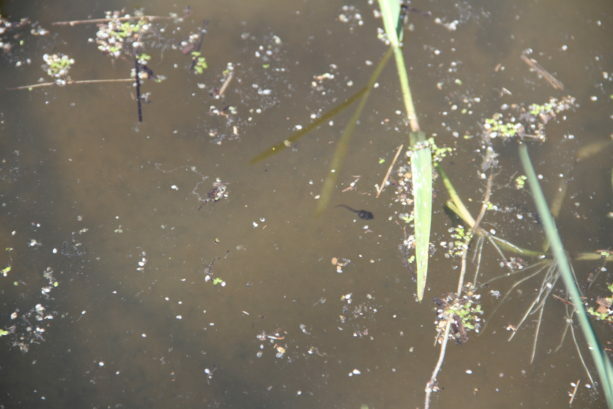 Right now the little pond is full of native Pacific chorus frog tadpoles, which will evolve into small frogs that will go out into the landscape and eat bugs the rest of the year. He created a urbanite (cement chunks) spillway into a twenty-foot swale. 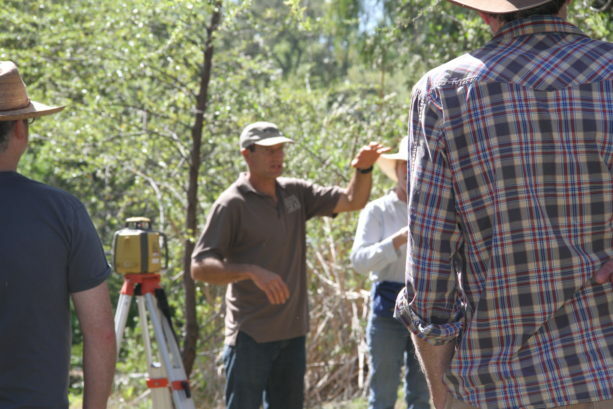 The class learned what a bunyip was and how to use the water level, and how to use a laser level. The swale will hold about 300 gallons of water that would have overflowed into another area, spread and sink the water. The swale was measured and marked on contour. Bermuda grass was pulled from it and set into trash cans to cook in the sun and hopefully be destroyed. The swale was then dug by hand. Old wood – branches, logs, boards and old posts – were laid below the swale, and covered by the dirt. 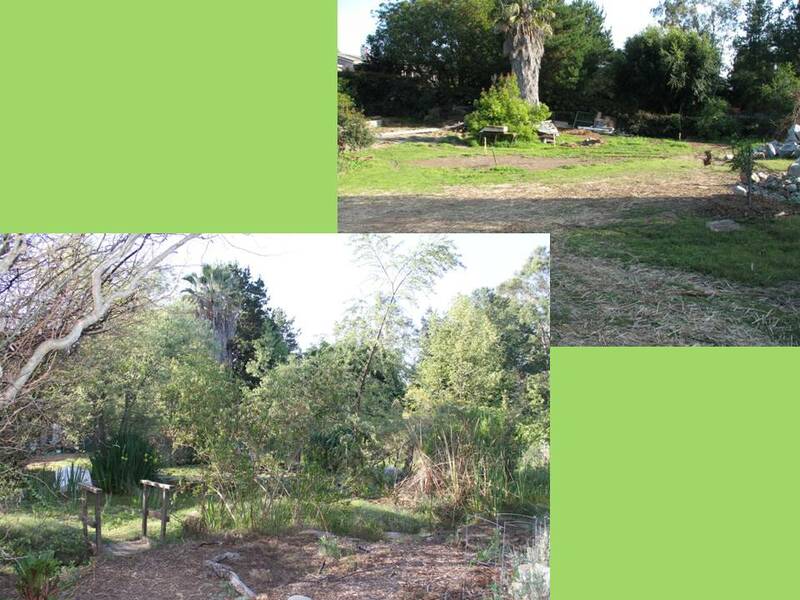 This hugelkultur will absorb seeping water, aerate and enrich the soil, and provide food and water over time for the trees downhill. More dirt was needed to cover the wood so we emptied the first rain catchment basin on the property of silt and hauled it down the hill. This was a lot of heavy work, and several of our attendees worked extremely hard with the wheelbarrows. Miranda and I have a lot of experience doing this heavy work, and we are glad that this swale project also emptied this basin. Our wonderful workshop attendees worked very hard in the heat. The end result was a swale of beauty. By creating level swales dug on contour, you can see how right it looks. It hasn’t been dug deeper into the ground at one end to force the swale to be level. If you measure on contour your swale can be of any size, and it will collect, passify, spread and sink rainwater into the landscape. Earthworks are the best way to hold water, and are imperative to reestablishing water tables, keeping wells running, keeping trees alive and maintaining springs and streams. A little earthworks will make a huge difference. What needs to be done now is to create a dedicated overflow from the swale into the main pond. As this area receives a lot of foot traffic, we’ll also need to haul more silt to make the raised walkway more gradual and blended with the paths around. 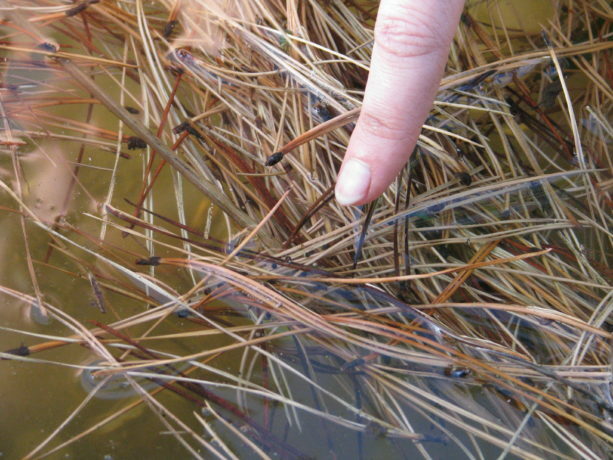 Once the tadpoles have grown and left the pond, we can drain it and use that silt. Two projects in one. 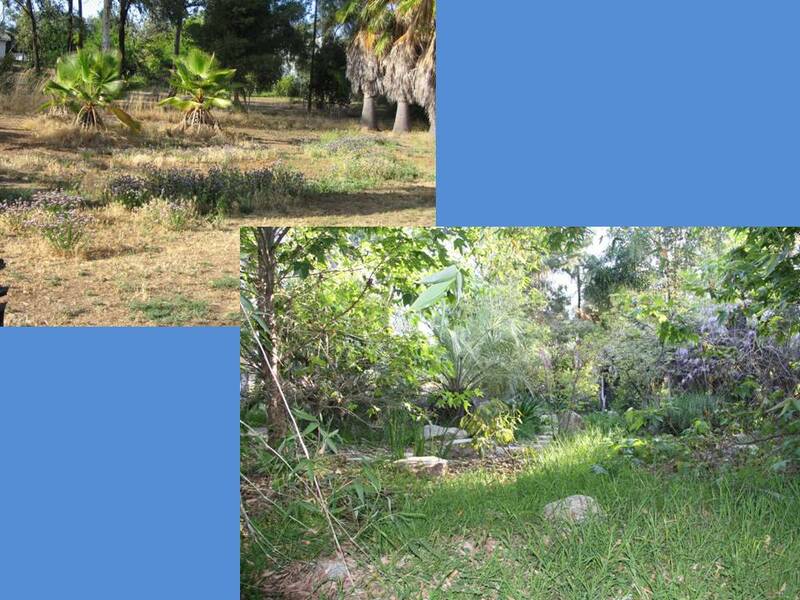 Prior to the project Miranda carefully removed a lot of healthy creeping red fescue from the work site. After the swale and spillway were dug she replanted some of it. Native yarrow will also be planted to help hold the swale. A huge thanks to the many people who came to learn and work on site. No matter how many movies you watch or books you read, having hands-on experience makes the education click. And an extra huge thanks to Alden Hough for his expertise and hard work. 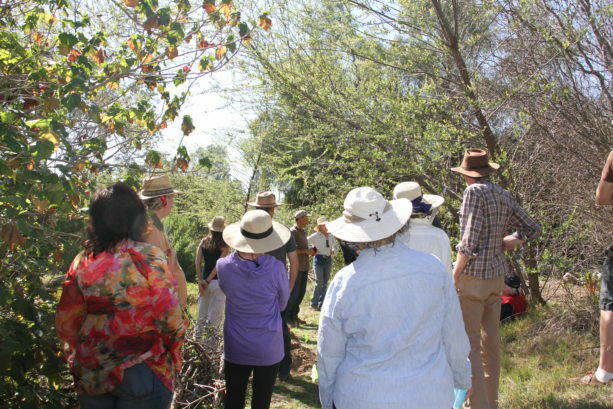 Please visit Sky Mountain Permaculture in Escondido for more classes – earth bag dome building included – coming up there. 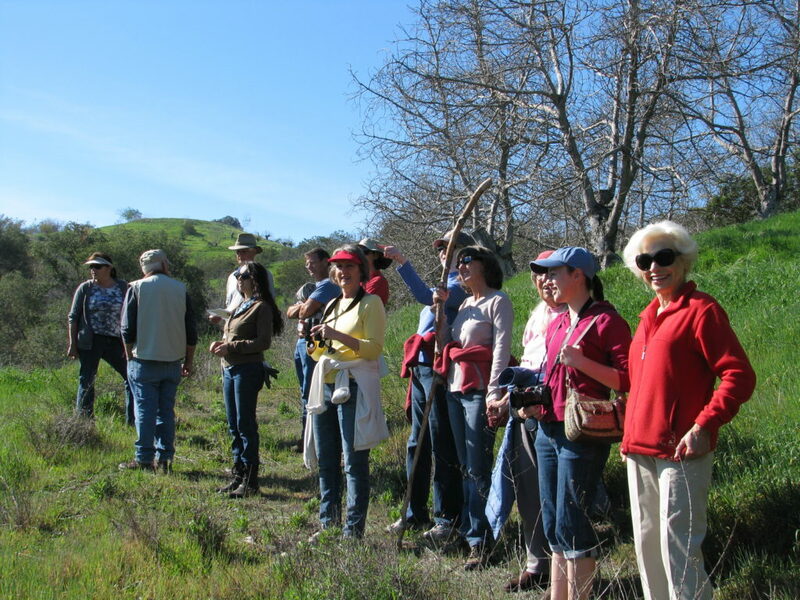 Our next Finch Frolic Garden workshop will be in April: April 22, 2pm – 4pm: The Many Benefits of Trees: Care, Nurturing and Pruning . 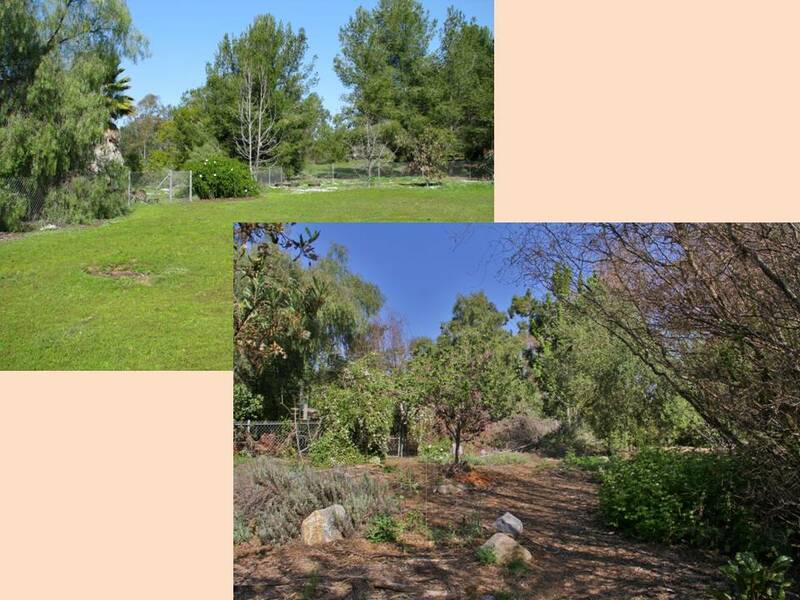 Roger Boddaert, the Tree Man of Fallbrook and professional landscaper who planned the original garden that would evolve into Finch Frolic Garden, will talk about trees. So many trees are dying due to the drought, and we need to replace them to help shade and cool the earth and hold onto moisture. But what to plant, where and how to care for them? 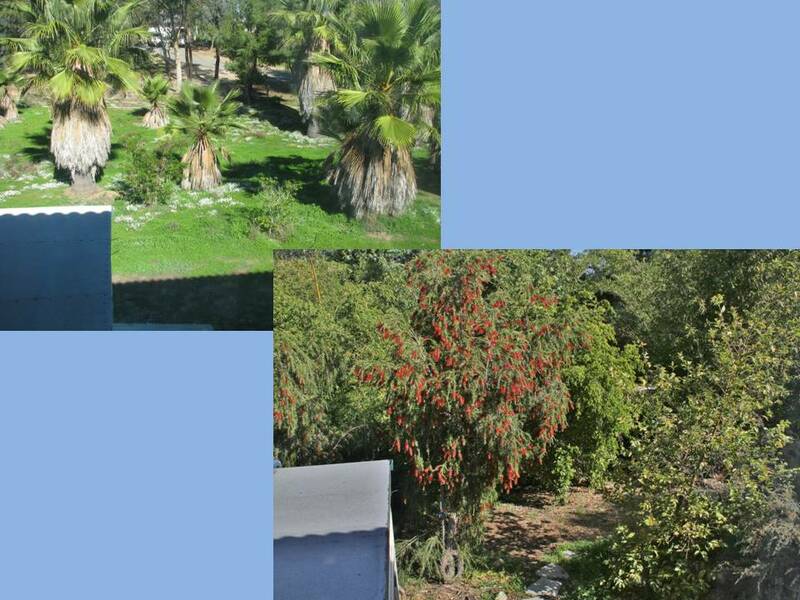 Roger will take you through tree care based on fifty years of experience in landscaping. RSVP to dianeckennedy@prodigy.net. Go forth and dig swales! Check out Finch Frolic Garden on Facebook. Also on Twitter. Daily fun information on animals and plants. Vegetariat Updates Emailed To You.